I think there must be some rule that at least one Caudill nominee must have an intriguing and unwieldy title. Of the 2008 nominees, I think The Misadventures of Maude March, or Trouble Rides a Fast Horse takes that honor. Of the 2009 nominees, I am happy to bestow that honor on Cornelia. "Cornelia is a lonely little girl whose famous pianist mother often leaves her alone while she goes on trips. Having a famous mother is a burden for Cornelia, who feels like most people she meets are more interested in her mother than they are in her. Until she meets her new next-door neighbor- Virginia Somerset. Virginia is the only grown-up that's ever treated Cornelia like she was her own person and Cornelia grows to relish hearing Virginia's stories of her travels with her sisters. There's not a lot of plot in this book- the bulk of the book is made up of Virginia's stories. 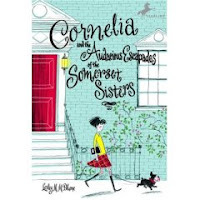 Even so, you get to know the Somerset sisters a bit and their escapades can be funny. The book seemed a bit too long to me and I'm not sure how I feel about the ending..."